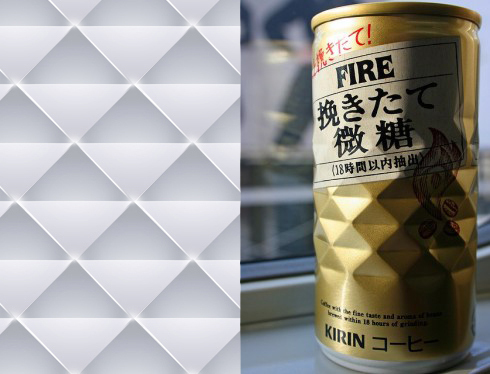 “Fire” is a canned coffee — one of a number of products from Kirin that are packaged in a faceted “diamond cut” can. 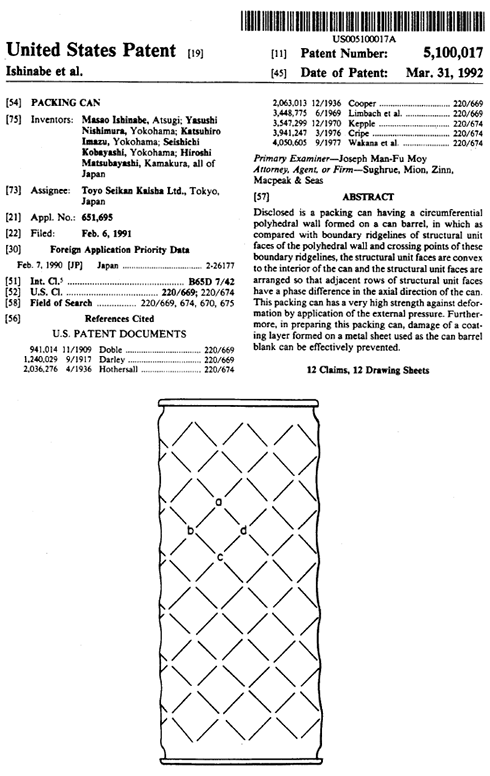 More familiar to consumers in Japan, this is a type of can that Toyo Seikan has been manufacturing since 2001. 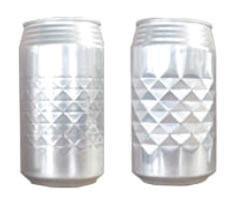 Comparing its pattern to some other soda cans we’ve considered in the past — the 1966 harlequin patterned Coke cans and Jorge Ubeira’s series of hand-bent Diet Coke cans — one might reasonably wonder whether there is something geometrically inherent in cylinders that makes this pattern particularly suitable for cylindrical packaging. 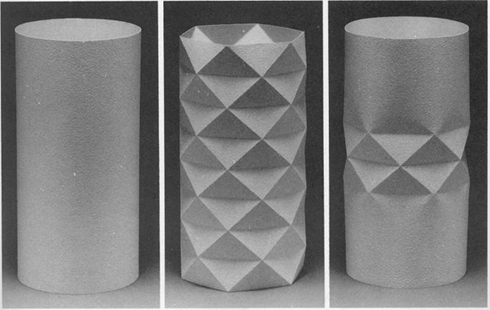 As it happens, Toyo Seikan’s “diamond cut” can pattern derives from research at the “Institute of Space and Aeronautical Science” in Tokyo: Koryo Miura’s 1969 paper, Proposition of Pseudo-Cylindrical Concave Polyhedral Shells. 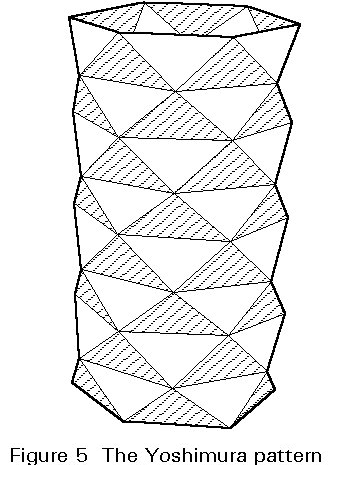 The three-dimensionally structured truss (triangular framework structure) design, called a “PCCP shell” (Pseudo-Cylindrical Concave Polyhedral Shell), was developed during the process of space engineering research. 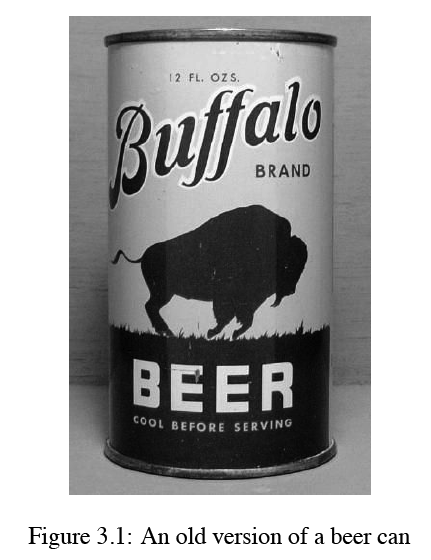 It was incorporated into the can processing technology to produce diamond cut cans. 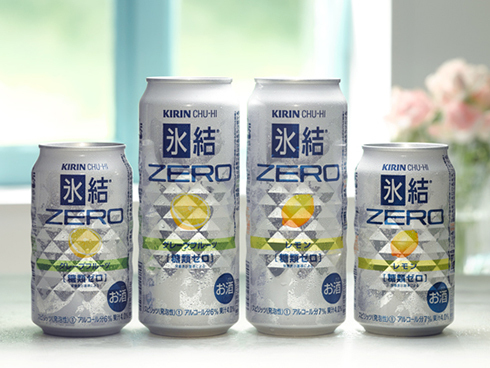 While many have marveled at this practical application of aerospace technology to quotidian soda-can packaging, the fact is, that seamless beverage cans were an important part of the research from the very beginning. 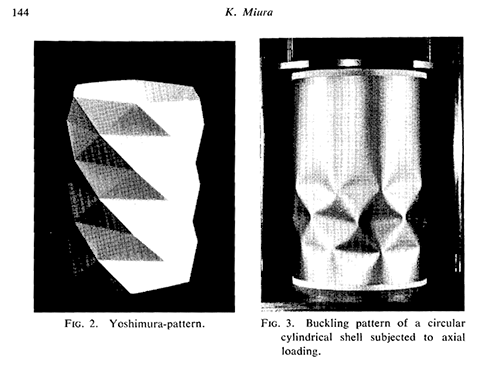 One simple method, originated by Horton at Stanford University, in the early sixties, for obtaining accurate isotropic cylindrical shell specimens inexpensively is the use of seamless beer or soft drink cans. 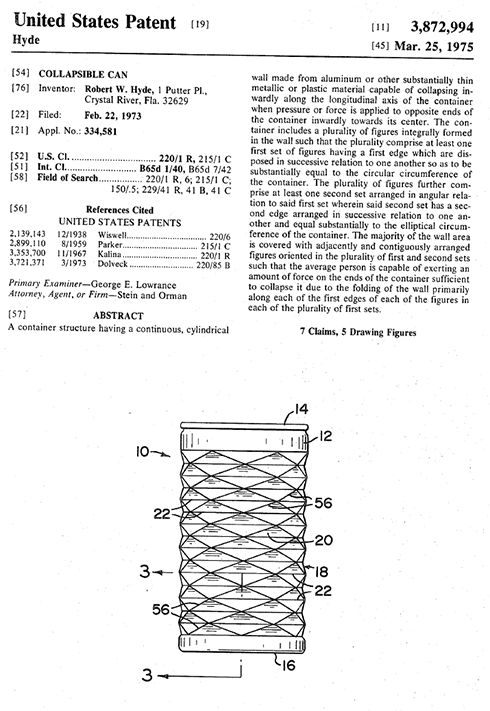 Since these thin-walled cans have to be within the close tolerances demanded by the automated filling and sealing process, they represent a source of specimens with accurately repeated dimensions. 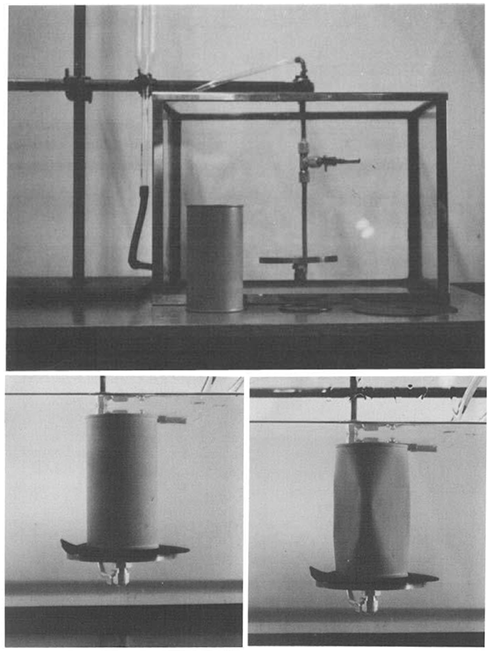 Recently this idea has been revived by Arbocz and Elishakoff at Delft University of Technology in a test program related to stochastic stability analysis and at the Technion Aircraft Structures Laboratory in a test program on buckling of shells under axial impact. A special production run of empty steel beer cans without paint and without closing lids has been made, yielding specimens with (R/t) = 300. The shells have, however, an integral bottom end closure, which has to be removed, some axisymmetric thickness variations with height and quite significant residual stresses. These have to be studied further for more precise evaluation, but even now, though undefined, they are practically identical for the many specimens made by the process. The beer can was denied its original purpose in life. Before it got to the filling station in the beer plant, it got removed from the machine to be of use in the investigation of imperfection sensitivity of thin-walled shells. As it found out what was going to happen, the beer can reconsidered what to do. It could not taste the beer it had waited for for so long. However, this was not an unrealistic thought. Serving as a container for some liquid, whilst not being able to drink, and waiting for some person to come along and empty you and then get thrown out of the window if you were unlucky, or get recycled if you weren’t. No, one had to look for new opportunities. What was this imperfection sensitivity all about? 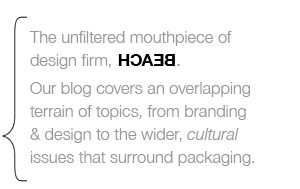 Thin-walled shells, that is me, it thought. Am I alone in this world or are there more like me? Yes, I know lots of fellow beer cans. Even some vague far away families who prefer cola or orange juice even. But they are all small like me. The can then found out that there are huge shells, dinosaur tall compared to him, but not extinct. They did not contain stuff like beer, or coke, but very interesting sounding stuff like LOX or LH2. The can did not know what kind of stuff this was, but realized this: these big brothers were about to fly to the moon, to Mars or even maybe out of the solar system. No short life time, no low mile coverage, no, just your ordinary Saturday evening getting sold, getting drunk and getting thrown away. These guys really went somewhere. Now this was something to think about. The little can thought that even though he could not fly into space, it would also mean a lot to him if he could in some way help his big friends to safely fly into the sky. also an icon w/a hand wraped around the CAN,PLASTIC or GLASS.